226 pages | 13 B/W Illus. Corporate Communication: A Marketing Viewpoint offers an overview of the framework, key concepts, strategies and techniques from a unique marketing perspective. While other textbooks are limited to a managerial or PR perspective, this book provides a complete, holistic overview of the many ways communication can add value to an organization. Step by step, this text introduces the main concepts of the field, including discipline and function frameworks, corporate identity, corporate and employer branding, corporate social responsibility, stakeholder management, storytelling, corporate associations, identification, commitment and acceptability. In order to help reinforce key learning points, grasp the essential facts and digest and retain information, the text offers a comprehensive pedagogy, including: chapter summaries; a list of key words and concepts; case studies and questions at the end of each chapter. Principles are illustrated through a wealth of real life examples, drawn from a variety of big, small, global and local companies such as BMW Group, Hidria, Lego, Mercator, Krka, Barilla, Domino's Pizza, Gorenje, Si Mobil, BP, Harley-Davidson and Coca-Cola. 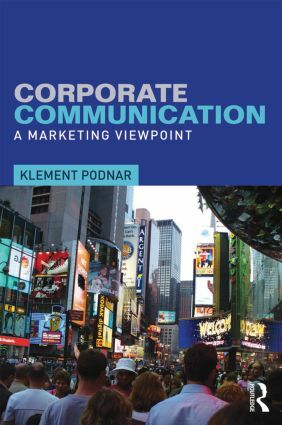 This exciting new textbook is essential reading for all professional corporate marketing and communication executives, as well as undergraduate and postgraduate students of marketing and public relations, not to mention managers who need a complete and accurate view of this increasingly important subject. Klement Podnar (PhD) is a professor at the Faculty of Social Sciences at the University of Ljubljana, where he teaches Corporate Communication, Basics of Visual Communication and Marketing. He serves on several editorial boards of international journals and is as an associate editor of the Journal of Promotion Management. His research has been published in a number of international journals including: Journal of Business Research, European Journal of Marketing, Corporate Communication: An International Journal, and Journal of Marketing Communications. Klement Podnar is the organizer of several international conferences and cofounder of the International CSR communication conference.